In many ways, Overwatch’s newest hero Ashe is a contradiction. She’s pinpoint-accurate at a distance, but she’s not exactly a sniper in the same sense as Widowmaker or Hanzo. Her HP pool drains faster than a water balloon hitting a ceiling fan, but she can get down in the thick of things and help capture points. 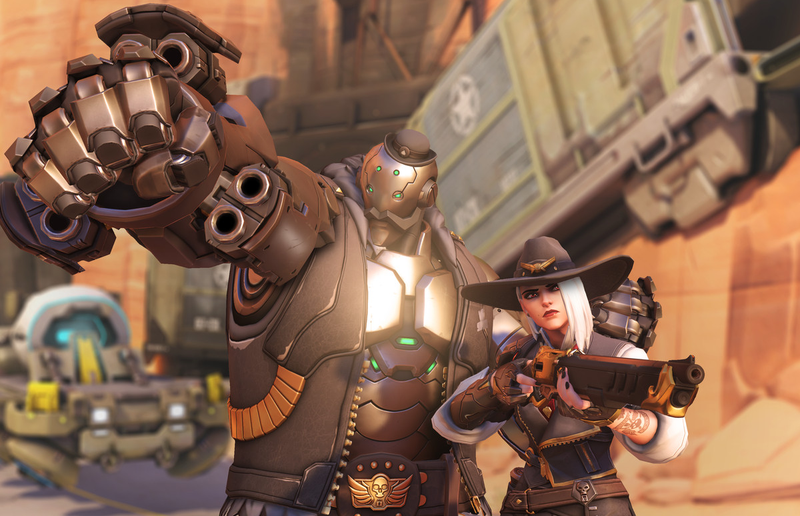 Ashe doesn’t fit neatly into any of Overwatch’s pre-existing roles, but she’s fun to play. She just takes a little getting used to. Or a lot. At first glance, Ashe—who I got to try out at BlizzCon over the weekend, and who just arrived on Overwatch’s PC public test server today—has a pretty straightforward kit. Her semi-automatic “Viper” rifle is range-y, popping off quick, damaging shots normally or slower, more damaging shots if you’re in scoped mode. She can also hurl a bundle of dynamite that explodes in the traditional dynamite fashion (wick goes “psssssh” until stick goes boom) or immediately if you shoot it. Either way, it deals damage on impact and leaves opponents burning both with embarrassment—if they accidentally shot the dynamite and blew themselves up—and, crucially, fire, which deals additional damage over time. She also has a shotgun sidearm she can whip out for a quick bit of additional damage that knocks enemies back. Her ult, meanwhile, summons already-beloved mustache robot B.O.B. to smack enemies around and sweep up the remains with his arm cannons. The way these abilities combine is what makes Ashe a handful. Sure, she can use her shotgun to disengage from enemies who’ve gotten all up in her space, but she can also aim it at the ground for a high-flying leap, allowing her to create frequent on-the-fly vantage points or reach higher ground. Then there’s B.O.B., who, when he is in play, acts like and is treated like another hero. This means that he can be hit with heals or buffs like Ana’s nano boost, and he can even capture points. In the right moments, then, Ashe can be an absolute game-changer on the point, with B.O.B. knocking everybody down and banging them up while she tosses out a stick of dynamite to create chaos, deal even more damage, and wreak havoc on tanks’ barriers. Granted, she can’t just do all of that whenever, but when she’s on, she’s really on. Oh, and I’ve barely even talked about her gun, which has a lethal bite, but also an acclimation period. See, at first you might expect it to function like Widowmaker’s sniper rifle, but it’s not nearly as powerful or accurate from long distances. If you try to play Ashe like Widow, you’ll just be playing a worse version of Widow. Ashe seems better suited for levels that have a few lengthy lines of sight but are broadly constrained—spots, in other words, where Widowmaker or other snipers get crowded and have to spend all their time on the back foot. And while Ashe is extremely susceptible to getting run over by, say, a charging D.Va or a leaping Winston, she’s got options in closer quarters. She can swat encroaching enemies away with her shotgun or use the same weapon to rocket into the air and drop a stick of dynamite. I think it will still take some time for players to figure out exactly where and when Ashe works best, but she’s got potential to spice things up in more subtle ways than recent smashy-smashy heroes like Brigitte and Hammond. She’s also not a knockback machine—at least, not a constant one—like they are, so that’s a good sign for those who are annoyed by the current state of the game. And then there’s B.O.B. Good old B.O.B. If you can’t feel optimistic about an ice-cold cowgirl who’s best friends with an oil-sweating mustache robot, well, I don’t really know what to tell you.